Authored by thsurrel on Dec 7 2018, 12:36 PM. Can you develop why ? Is it because of the added code ? From a usability point of view, does it not make sense to disable something that is not possible ? 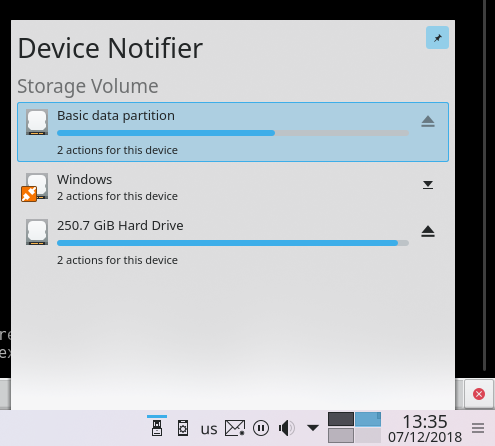 My root and home partitions don't appear in the devices notifier (they're on an internal NVMe SSD). How do you get in this state? You need to configure the plasmoid and select to show "All devices". 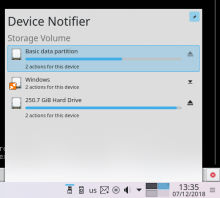 It's showing removable devices only by default (which sounds pretty sane!). Ah, I see! Lol it never even occurred to me to try to configure the plasmoid. Given that, I think this patch makes sense. No point in allowing people to do invalid things. Should we also give the same treatment to the partition that ~ lives on, if it's different? If this patch deals with the UI, is it possible to align the eject button to the middle using the progress bar as the center? Thanks for this one too !